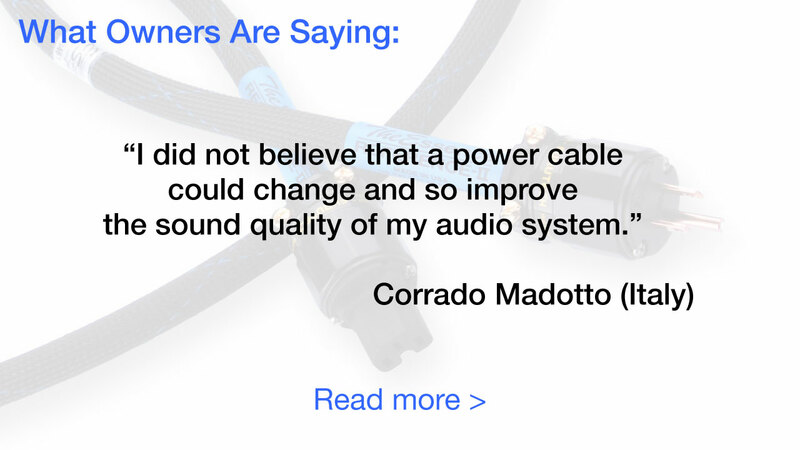 "At last, a power cord that can properly be termed a component." The Essence established benchmarks for lifelike dynamics, natural harmonics, precise imaging and resolution. 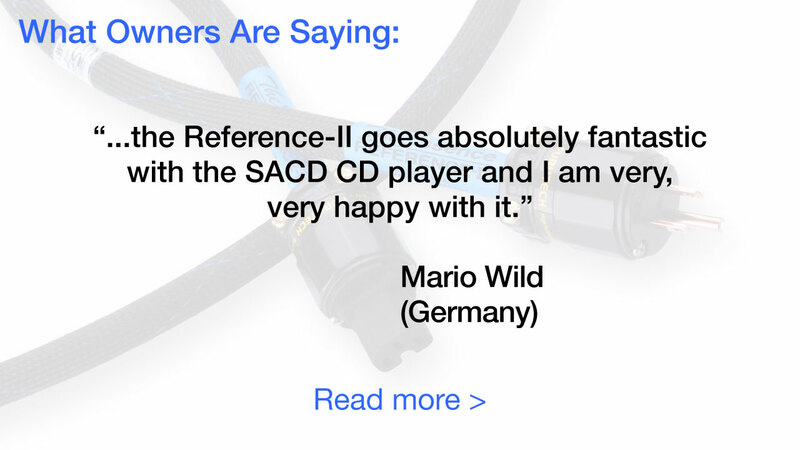 Through more than 20-years of development, The Essence has never strayed from it's basic character; how it affects the performance of connected High End Audio components. The Essence is our statement product, our "Corvette". The Essence embodies the best design and engineering, materials and manufacturing processes without regard to cost. 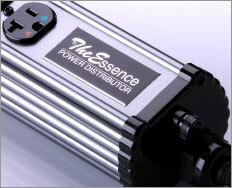 Over the years we have continued to build upon The Essence's strengths, extending and enhancing it's performance. 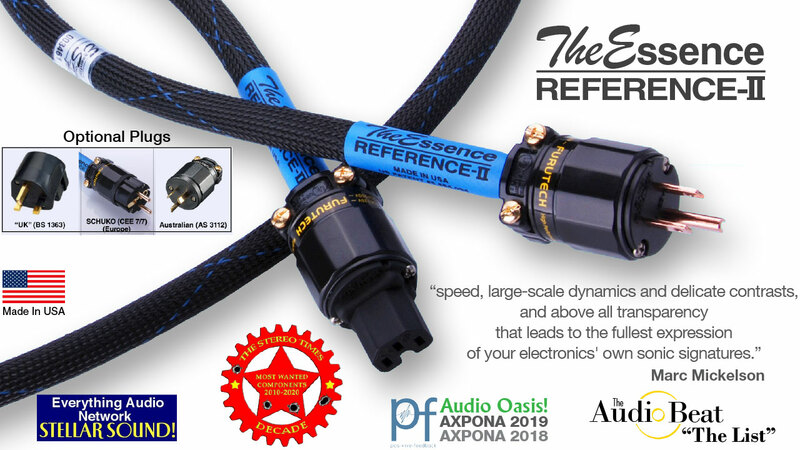 With optimized geometry, higher-purity copper conductors, cryogenic treatment to -300o Farenheit, and new Furutech plug and connector with proprietery termination process, our 5th generation "The Essence Reference-II" power cord reaffirms it status as "the best of the best". The Essence of music is emotion! 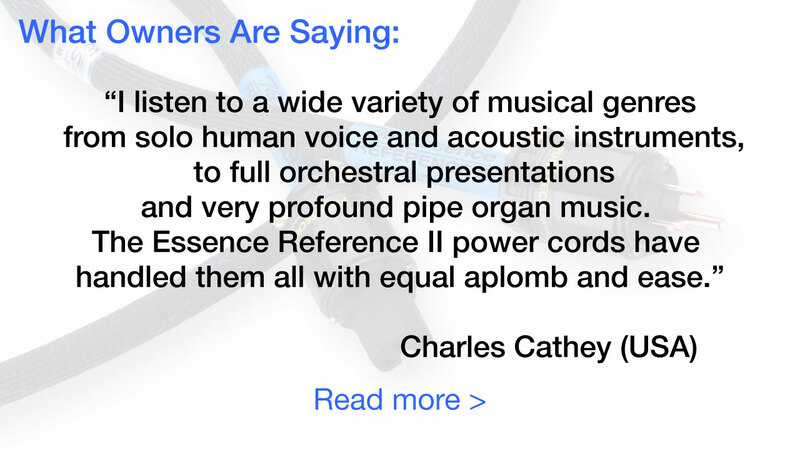 Simply put, The Essence Reference-II power cord affords your High-End Audio Hi-Fi system the most realistic, emotionally engaging, performance possible. Digital has gotten a bad wrap, being blamed for the harsh transients, thinner harmonic structure and lack of resolution one commonly notices when compared to the best vinyl. 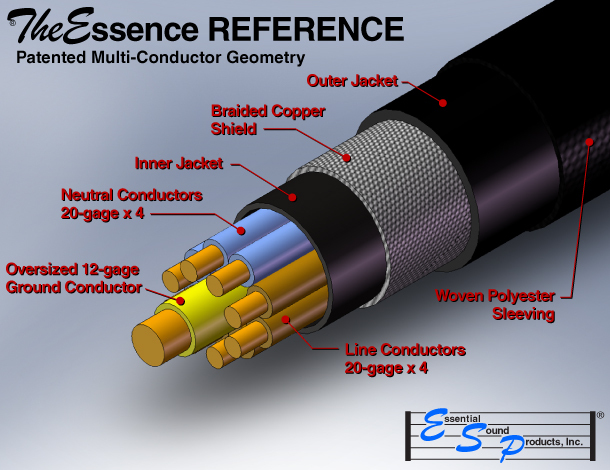 Michael Griffin, designer of The Essence, understood early on that a significant contributor to digital's shortcommings was "phase distortions" that can enter components via the ac mains. Also, stock power cords cause sub-optimal performance of the component power supply. Every generation of The Essence has excelled and improved upon its ability to filter phase distortions that rob the music of its emotional impact. Eliminate these distortions, and digital sound can have the smooth, fatigue-free character that is so appealing with analog. "Adding The Essence (Reference) power cords was tantamount to upgrading the units (and I've heard upgrades that were far more subtle). There was more ambience on the best CDs than I ever believed possible. 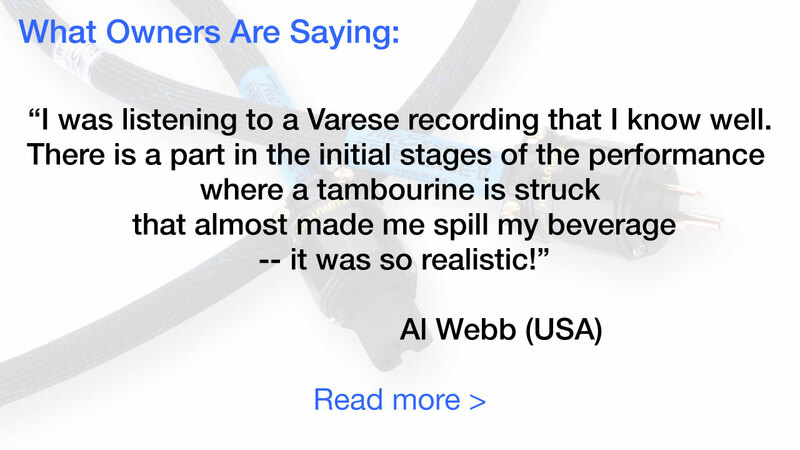 Strings were less metallic and strident and the cable's effect on imaging had one wondering whether the company had built a digital VTA adjustment into their Essence Reference." Selection of plug and connector components and termiantion process is critically important to realizing all the performance the cable affords. 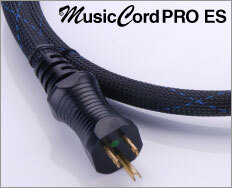 Specialty audiophile plug and connector manufacturers have made genuine performance advancements. After extensive evaluation of samples from several manufacturers, Essential Sound Products selected Furutech plugs and connectors with terminal blades and pins made from pure, unplated, high-purity copper. These components are the perfect compliment to the Reference cable line/neutral conductors, which are also high-purity copper. The purchased plugs and connectors used for The Essence literally undergo a transformation to enhance their performance prior to assembly. 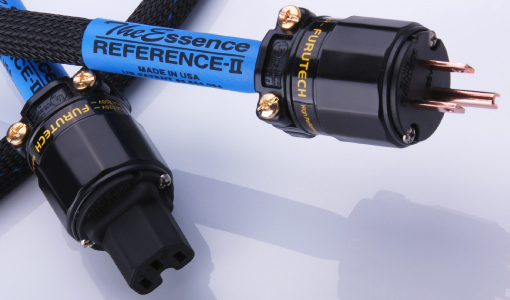 After termination, each connector is epoxy filled to hermetically seal the internal components, preventing oxidation, and providing maximum resonance control, strain relief and mechanical integrity for years of trouble-free performance. Cryogenic processing alters materials at the molecular level. This permanent, irreversible process releases residual stresses, and alleviates the negative effects of crystalline grain boundaries in copper and brass. 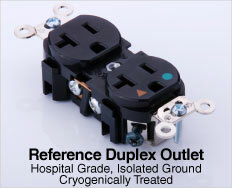 Cryogenic treatment effects a measurable reduction in the cord's resistively for improved current flow. The result is less distortion, which impacts all performance attributes, but particularly resolution. 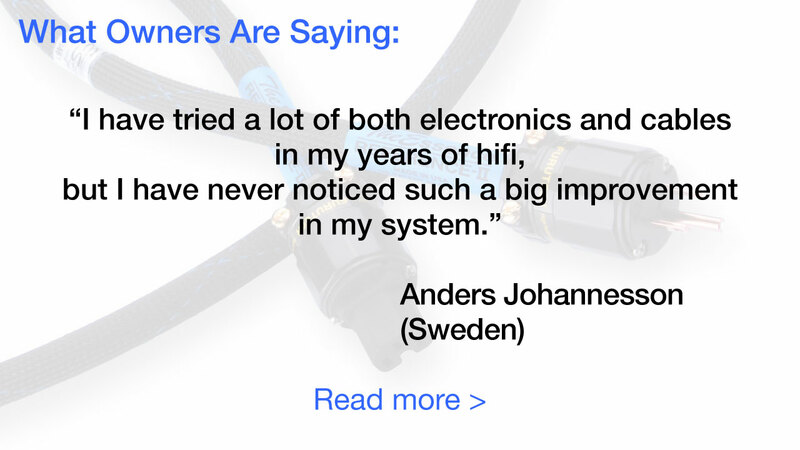 Let us build your power cords to your specific configuration requirements. Available Furutech C-13 and C-19 (20-AMP) connectors, compact and miniature C-13, connectors.